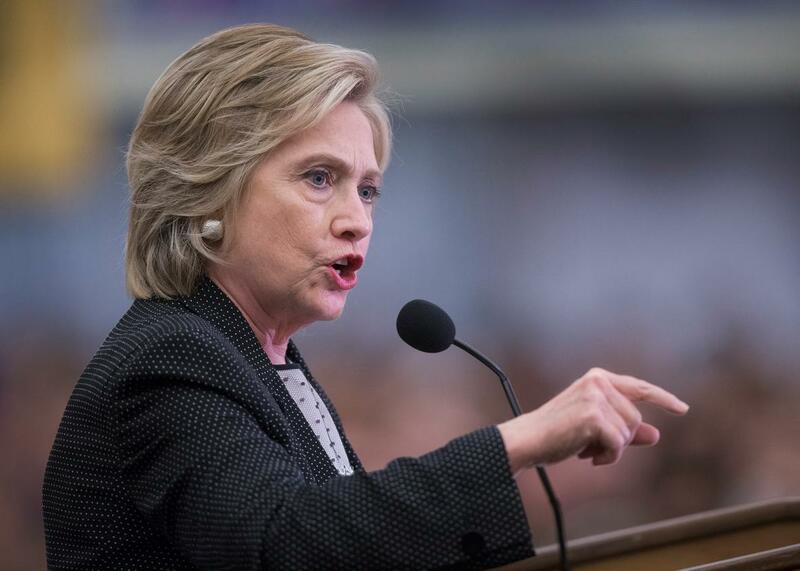 Hillary Clinton's prescription drug plan: The Democrat launches a perfectly timed attack on Big Pharma. Hillary Clinton speaks to guests gathered for a campaign event at the University of Wisconsin-Milwaukee on September 10, 2015 in Milwaukee, Wisconsin. Clinton’s multi-pronged solution focuses on shifting both supply and demand in favor of consumers. She wants to: prevent companies from keeping cheaper, generic alternatives off the market; force drug companies that receive taxpayer support to invest more in R&D; place a monthly $250 cap on how much insurers could charge people to pay out of pocket for specialty drugs; allow the federal government to negotiate lower prices for patients on Medicare; allow patients to fill their prescriptions with drugs from Canada, where medication is often cheaper; and prevent drug makers from deducting the cost of TV ads. The proposal—which shares more than a few similarities with a plan already put forward by Bernie Sanders, as well as one released last week by a liberal policy think tank with close ties to the Obama administration—comes with a distinct populist pitch. It also comes at an incredibly opportune time. Big Pharma is never going to be mistaken for a sympathetic figure: the industry’s profit margins are roughly twice that of banks; the cost of prescription drugs, meanwhile, grew by 13.6 percent last year, about double the average rate of the previous five years. But the industry is currently in the midst of particularly bad PR headache: On Monday, the New York Times introduced the world to Martin Shkreli, a former hedge fund manager who jacked up the price of Daraprim—a drug used by AIDS patients to fight off infections that can prove fatal—from $13.50 to $750 a pill overnight. Shkreli’s company isn’t the first to implement such a get-rick-quick scheme, but his particular blend of general bro-iness and unapologetic capitalism makes for a particularly unattractive face for the industry. But even without this week’s outrage, prescription costs were already fertile ground politically. Roughly half of all Americans take a prescription drug in any given month. It’s no surprise, then, that voters have noticed that drug prices are climbing. According to the most recent polling by the Kaiser Family Foundation, roughly 3 in 4 Americans say that current prices are unreasonably high. Many of Clinton’s specific policy prescriptions, meanwhile, already have widespread support. In the Kaiser survey, 83 percent of respondents said they wanted the government to use its bargaining power to negotiate lower prices for those on Medicare; 76 percent said they wanted limits on what companies can charge for high-cost drugs; and 72 percent said they wanted Americans to be able to buy drugs imported from Canada. Even among self-identified Republicans, support for all three of those proposals was at 70 percent or above. That’s not to suggest pushing those reforms through Congress would be a breeze—there’s a reason that the authors of the Affordable Care Act steered clear of such efforts. Congressional Republicans remain obsessed with repealing Obamacare, and it’s hard to imagine the GOP would be any more cooperative if Hillary Clinton is in the White House. Big Pharma, meanwhile, has the big bucks to fight any efforts to cut into their own bottom lines. Still, for Democrats, the newfound focus on drug prices is a clear sign that after years spent defending Obamacare—a job that is getting easier and easier—they’re finally ready to play offense again. Given the public support, that’s a sentiment that Hillary Clinton no doubt shares more than most.